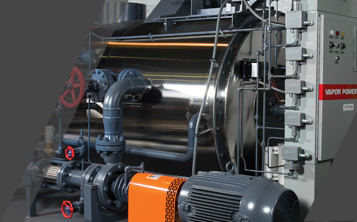 Vapor Power offers a wide range of after-market support and services for your Thermal Fluid boilers. From the first day of operation and for the life of your boiler, Vapor stands ready to assist. New, microprocessor-based control panels are available to retrofit obsolete control systems on our steam generators and thermal fluid heaters. These panels are equipped with modern digital coil and stack temperature controls for comprehensive monitoring. The new panels provide a higher level of safety and state-of-the-art controls, with features beyond the capacity of conventional controls. These features significantly reduce service cost and downtime. The flame safeguard control provides diagnostic information to aid the operator if troubleshooting becomes necessary. Vapor Power steam generators and heaters require fewer and more reliable components than what is in your existing control panel. As a result, wiring diagrams are simpler and service parts requirements are reduced. The new Vapor Power control panel will pay for itself within a short period of time. The reason is the panel’s ability to help minimize downtime by assisting with troubleshooting and eliminating the need for outside service if control problems occur. Your control panel can be replaced with the Flame Safeguard of your choice (Honeywell or Siemens), or upgraded to include linkageless technology. Upgrade your existing panel and eliminate difficult troubleshooting, obsolete components and the risk of going down with no readily available replacements. The digital temperature controls used in the upgrade kits have several advantages over existing controls in units manufactured prior to 1993. Microprocessor-based technology offers dependable temperature monitoring and improved protection of your boiler or heater. New, thermocouple wires are included for connection to your existing thermocouples. New thermocouples can also be included if desired. Keep in mind that if your existing controls are not tested and verified regularly, they might not be providing protection for your unit. Ask your local service representative to perform a safety test on your existing temperature controls. Upgrade kits are comparably priced to most existing controls (if they are still available) and are a better investment. Fuel-Air Control lets you develop entirely independent combustion curves for each fuel. Microprocessor-based control allows for more accurate control. This accuracy increases fuel efficiency and offers system payback in a short period of time. Complete setup for a two-fuel system is just 4 to 6 hours.